Ferdinand Eugene Victor Delacroix was an extremely influential French Romantic painter. He had a long successful career, receiving continual commissions from the French government and was favored by critics of his day. His violent subject matter, intense passion and bright colors changed the art world forever. His technique is said to have had a lasting impact on subsequent generations, such as the Impressionist and Post-Impressionist movements. April 26, 1798 marks the day that the world welcomed one of the most remarkable Romantic painters, Ferdinand Eugene Victor Delacroix who was born in France. There is great confusion as to the lineage of Eugene Delacroix. 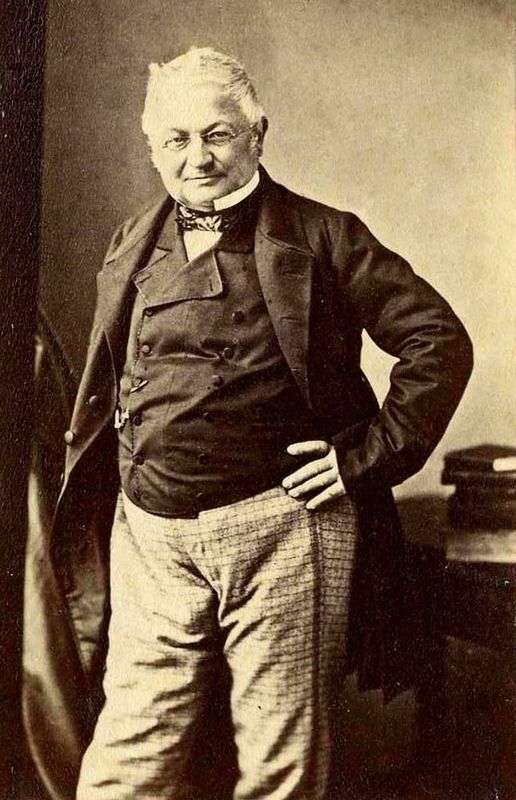 On record he was fathered by Victoire Oeben but theories point to his true paternity as belonging to the statesman Charles-Maurice de Talleyrand-Perigord. This is important to note, not only due to Delacroix's strong physical resemblance to Perigord, but because Perigord was a statesmen which may have helped Delacroix receive many important, hard to come by, patronages from the French government. 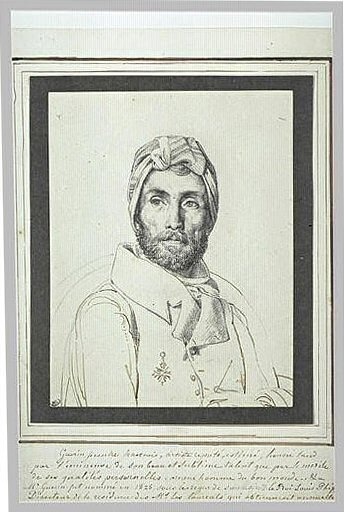 Oeben was also believed to have been infertile at the time of Delacroix conception. Other than that, Delacroix had a quiet childhood. Coming from a distinguished artistic family, it was only natural that he developed his own musical and artistic passions and at the age of 17 he began his classical studies, later becoming the pupil of Baron Pierre-Narcisse Guerin, a renowned academic painter. Aged 24, Delacroix was put in charge of architectural decorations from another statesman, Adolphe Theirs. His early years were influenced by fellow Romantic artists as well as polish composer and pianist Frederic Chopin. 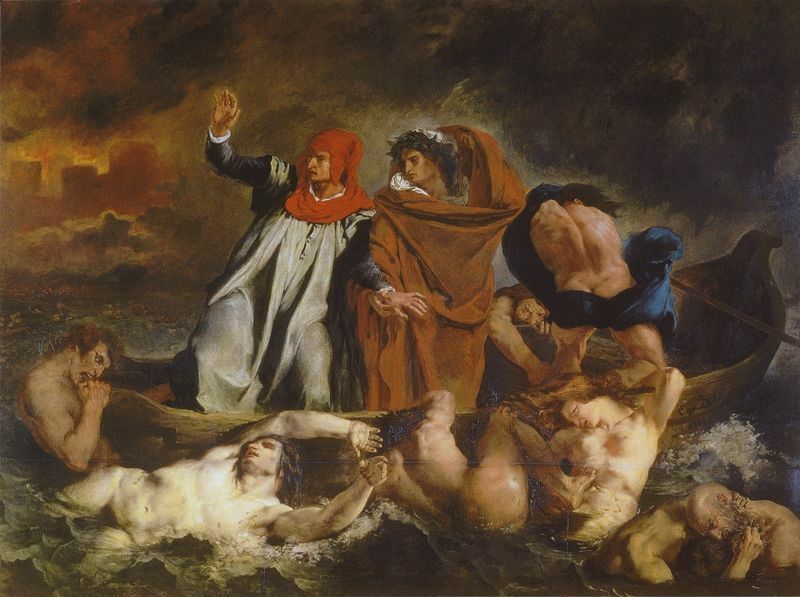 Delacroix created and exhibited his first masterpiece, Dante and Virgil in Hell, at the Salon of 1822. This piece, inspired by Dante's Divine Comedy, is known to have contributed to the development of the Romantic Movement. Early on, his work reflected the influence of Michelangelo's modeled figures and Peter Paul Ruben's color genius. 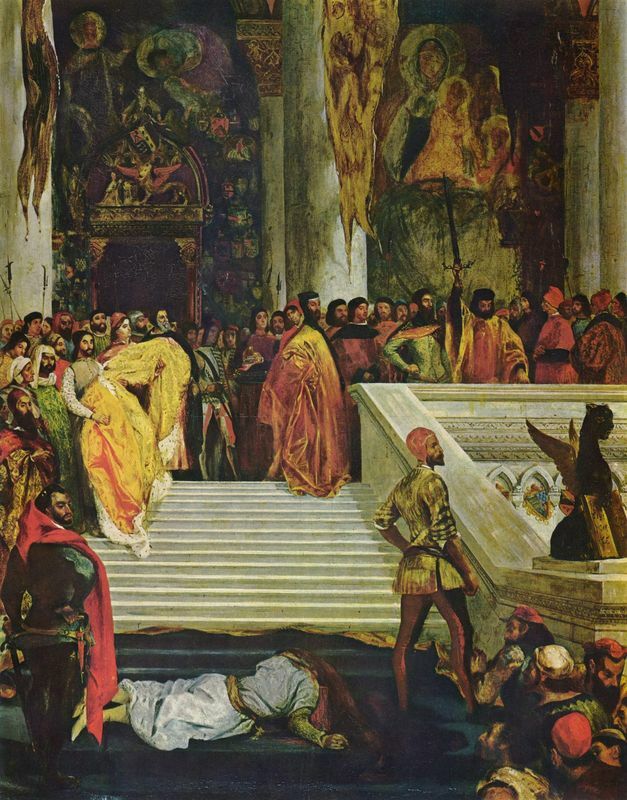 Throughout his intermediate years, Delacroix continued to paint under the influence of works by Dante, Shakespeare and the Romantic poet, Lord Byron. 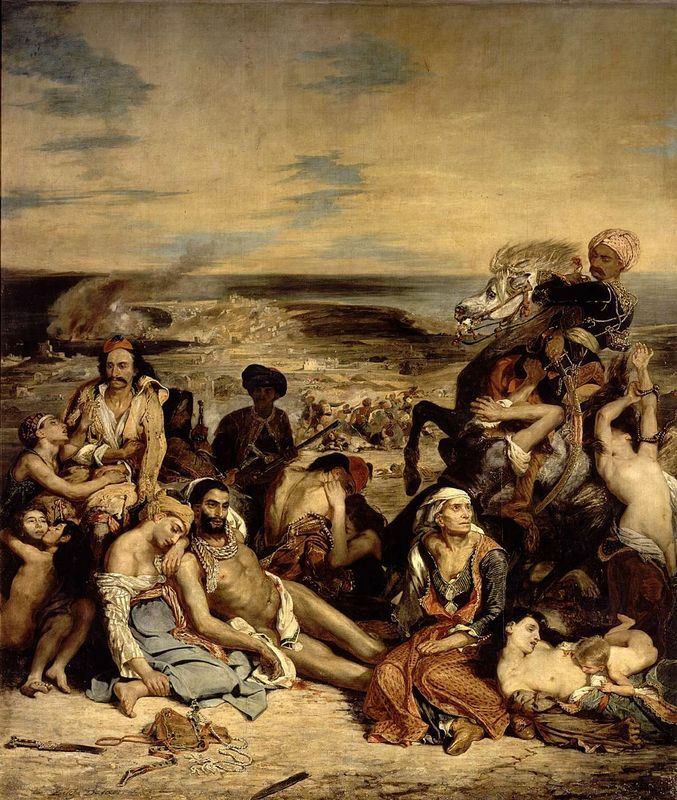 At his next exhibition at the Salon of 1824, his large canvas, Massacres at Chios: Greek Families Awaiting Death or Slavery, conveyed the bloody defeat of the Greeks by the Turks. This canvas was the first to demonstrate his ability to tap into the emotion of his subjects, both the haughty conquerors and the innocent victims. The pain and suffering he depicted here would become a common theme in his work. Just a year later Delacroix traveled to London to study the work of the English painters he greatly admired such as J. M.W. Turner, John Constable, and Sir Thomas Lawrence. Such contact with these artists is believed to have advanced his technical and cultural education. By studying their works, Delacroix felt he was closer to achieving the effects produced by his most admired role model, Rubens. 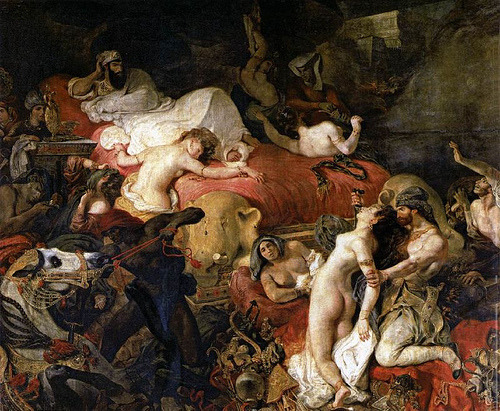 Another well-known painting by Delacroix is The Death of Sardanapalus. Yet again he paints a violent scene depicting the slaughter of women, slaves and animals. The lavish setting of fabric and jewels and luxury serves as a sharp contrast to the murdered victims in the image. 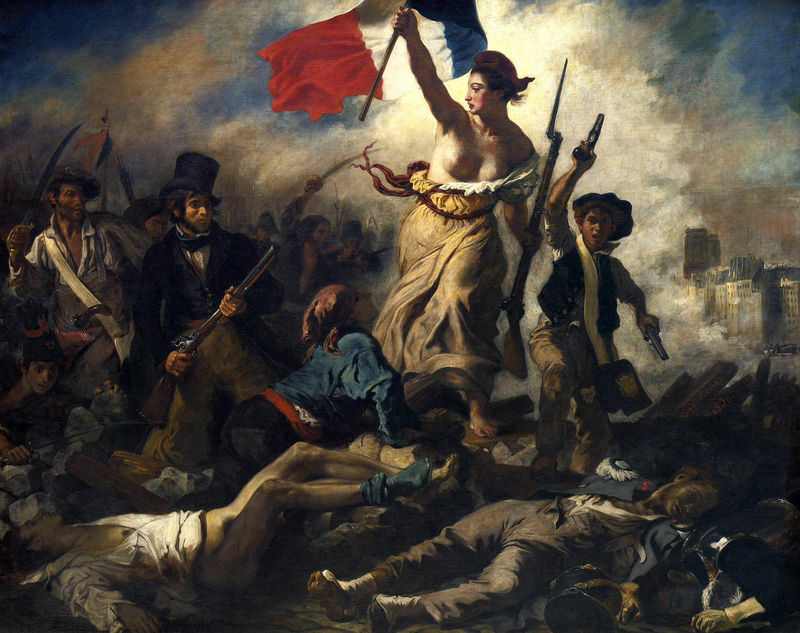 One of Delacroix's more important and memorable pieces, July 28: Liberty Leading the People was painted in 1830. It served to commemorate the recent French Revolution that had brought Louis-Philippe to the throne. This canvas reflected a change in the artist's style; he painted with passion and animation but the overall tone is a quieter one. Two year later, in 1832, Delacroix traveled to Morocco and there he toured with King Louis-Philippe's representative of the sultan. This insider's look of Morocco changed both Delacroix and his art, as he used Arab subjects in his work for the remainder of his life. He was refreshed by a culture that was so vastly different than the French life he was used to. The brightly colored, flowing costumes, the Arabs, the women, and the horses enchanted the artist and inspired many sketches, and from these Women of Algiers in their apartment came about. Delacroix spent the majority of his mature years decorating government buildings. His commissions included wall and ceiling murals which made him feel closer to his idol, Michelangelo. The content of his murals are said by Delacroix's supporters to rival Michelangelo's in both intensity and violence. Delacroix didn't stop painting canvases entirely, however. 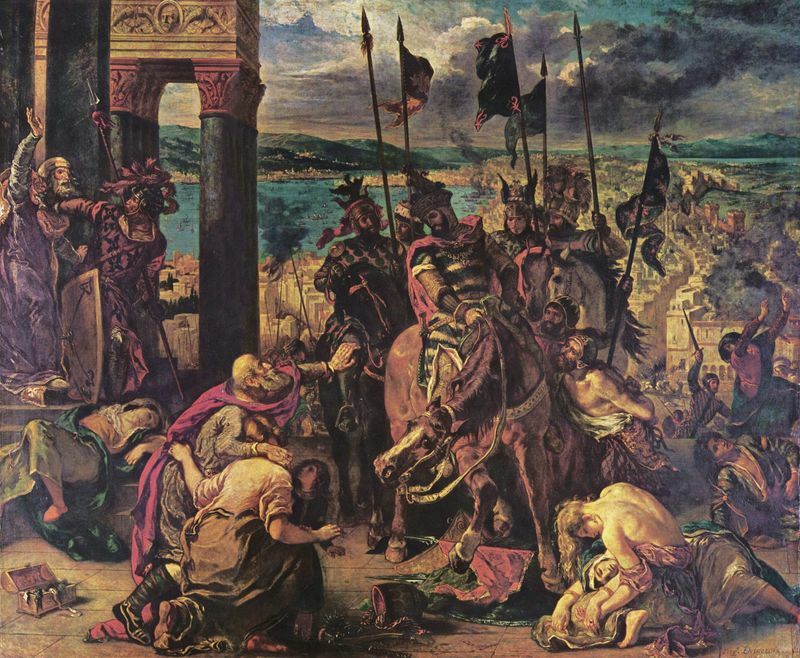 In 1837 he painted The Battle of Taillebourg and in 1840 The Taking of Constantinople by the Crusaders (April 12 1204) and he continued to paint smaller paintings of Arab, religious and classical subjects. In 1863 Delacroix died in France. He left behind 1000s of drawings, watercolors and prints as well as a legacy that forever changed the art world. His detailed journal entries are a treasure to all of his admirers and his innovations inspired the Impressionist and Post-Impressionist movements.